Becoming a parent is terrifying, especially when you didn’t have the best upbringing yourself. There’s a lot of pressure placed onto new parents these days and for new dads it can be especially tough. Men do seem to get judged as a parent a lot more than women. You only have to do a quick internet search to discover that dads are often talked down to and treated as incapable or less important. It leaves many doubting their abilities to be a good dad. You may also have a lot of doubt in your abilities if your own father wasn’t overly involved in your upbringing. Without realizing it, you may have held onto a lot of baggage from your past that’s starting to show now you’re a father yourself. 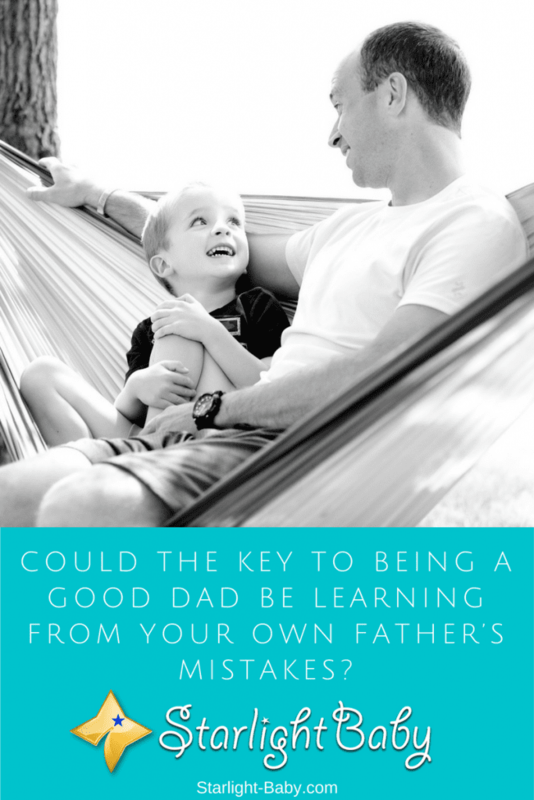 So how can you be a good dad and ensure you don’t follow in your own father’s footsteps? The first thing you’re likely to do when you become a dad for the first time, is use your own experiences as a resource. You may not even realize you’re doing it. It makes sense that you would look to your own father for guidance on how to raise your little one. Regardless of how good or bad they were at being a dad, they showed you growing up, what being a father is. We learn from experience and so there will be certain elements of your father’s parenting style that you bring into your own child’s life. However, that doesn’t mean you can’t change it or that you’re doomed to be the same type of father as your own. In fact, you can use the lessons your father taught you to become a better dad. If you were unfortunate enough to grow up with an abusive or neglectful father, you’re likely worried that you may resort to the same type of behavior. A lot of children who grow up in an abusive household, end up repeating the behavior with their own children. The reason this happens is because they don’t see it as “abuse”. To them, it was normal and how parenting should be. If you’re lucky enough to identify that it isn’t normal and you are determined not to repeat your father’s mistakes, you’re more likely to be a much better dad. The key is to recognize any issues you had with your father and work out how you can do things differently. For example, maybe your father was never around? Learning from his mistake, you can ensure you’re always there when your child needs you. Share the night feeds, spend as much time with your little one as you can and just get involved. Being present is the main thing that’s going to make you a great dad. If your father was abusive and you find you get angry easily when your child makes a mistake, recognize that and take steps to change. When you feel the anger building, remember how you felt as a child when your father used his anger to discipline you. This is often enough to calm you down. Whether you came from an abusive home or not, there is always something you can learn from your father that will help you become a better dad. When In Doubt – Research! Statistically speaking, one thing your father probably didn’t do is research how to be a good dad. So, the fact you’ve already done that and are reading this blog now proves you’re a fantastic dad. The internet has made it extremely easy to find advice on every aspect of parenting. While the way dads are portrayed still needs a lot of improvement, it’s much more acceptable for men to be more involved with parenting decisions today. Do as much research as you can on parenting. Get clued up on all the basics such as feeding, burping and diaper changing. Go to parenting classes and join online forums to talk to and get advice from other dads. We may be launching one of our soon, so be sure to sign up to our email list for updates! You can even research by watching how other parents handle difficult situations. Head to the grocery store and you’re bound to witness numerous parenting techniques. Some parents will be talking to their children with gritted teeth, trying desperately to get them to behave, while others will be calm and seemingly in control. Watching and learning from other parents, as well as from your own father’s mistakes is the best way to be the best dad that you can be. Overall, yes it’s scary becoming a dad, but you’re not alone. No new parent has a clue what they are doing, regardless of how many parenting books they read. Assessing any issues you have with your own father and identifying baggage you may be carrying will help you see where you need to change. Seeking advice from other parents and just getting involved at every opportunity will set you on the way to becoming an awesome dad. Just remember, making mistakes is all part of being a parent, it’s how you learn from them that makes all the difference. I don’t know if it’s the “key” or not because I’m the mom and I had a really terrific dad. My husband on the other hand? Let’s just say the difference between his parenting methods and his father’s methods were like the difference between day and night. When it came to parenting, I doubt that my husband even thought of his father or referred to him in any way. One of my other friends, had his father over shortly after his wife had a baby. He told his dad that he was not allowed to do certain things. Of course, his dad barked a typical response “Boy I raised you!” His response back was “ Yeah I know dad! I was there!” Grandpa got the message. Haha, that’s funny – “ Yeah I know dad! I was there!” – classic! Kidding aside, some dads are indeed able to determine what is good and bad parenting, as experienced from their dads. Good for your husband! Others just seem to repeat their father’s mistake. Sad but true. You are right being a father is really scary. I remember the first time, what my feelings were, I was overwhelmed and I was afraid that I will not be a good dad. Of course, that trying to be better than our parents makes us be a better parent. I don’t want to be like my father, he abandoned me, he never said “happy birthday”, or “I love you my son”, I just want to be something more for my son and I saw that I already am, and this makes me proud. Sorry to hear about your experience growing up, wallet. It would really make you wonder if you are able to become a good dad to your child. Well, congratulations! You seem to really enjoy taking care of your son. It’s just right to be proud of this accomplishment. Keep it up! Being a parent is never an easy task because no matter how or what angle you view it from, having a child changes everything in your life. And having a horrible childhood experience with your own parents doesn’t make it any easier for you, it certainly affects one psychologically, emotionally and even physically. But taking the first step in getting to be a better parent than yours were is the right thing to do. Definitely, making use of some of the tips listed here is going to help with such issues. True – one’s bad experiences with a parent or parents do not define what one becomes later on in life (although some also became like their parent/s). One has a choice to become a better person as compared to his/her parents. We were given minds that can think and reason so it’s up to an individual to decide what he/she would like to become. Still, nothing beats good guidance from responsible parents on which path to take. I have a deep attachment to my father. I spend my entire childhood and teenage with father. I lived with my father in the city and mother lived in the countryside where we had a farm and mother managed our farm. Because of some mistakes my father committed, my relationship strained with my father and I developed better relationship with my father. Even though I am more attached with mother than father these days, I highly value my father. My father mistakes have taught me lessons. Learning from a parent’s mistake is the best thing one can do in a bad situation. Since one knows how it feels to be in such a situation, he/she can decide to not do the same thing with his/her child.